After the check-in at the hotel and a first acquaintance with the surrounding area, make a reservation for the tour of the island by boat. In this way you will have the opportunity to have a look at all the beaches and choose the one that suits you best for the rest of your stay. Today you may swim at “Hohlidia” or “Vardia” beach. In the afternoon, visit Panagia church and enjoy the view and the sunset from up there. Later on, walk around the castle inside Chora and explore its secrets. Finally, have dinner in one of Chora’s squares and enjoy a drink in one of its alleys. Get on board for the tour of the island. Departure at 11:00. Arrival at 17:00. Lunch and local delicacies are offered on board. Later on, have fun with canoe-kayak in Karavostassis bay, or cycling in the surrounding area. Moreover, you may arrange an appointment with the scuba diving instructors for an unforgettable underwater experience. Later in the evening, enjoy the magnificent view from our hotel’s grand veranda, selecting fine wines from our cellar and local delicacies from the menu. 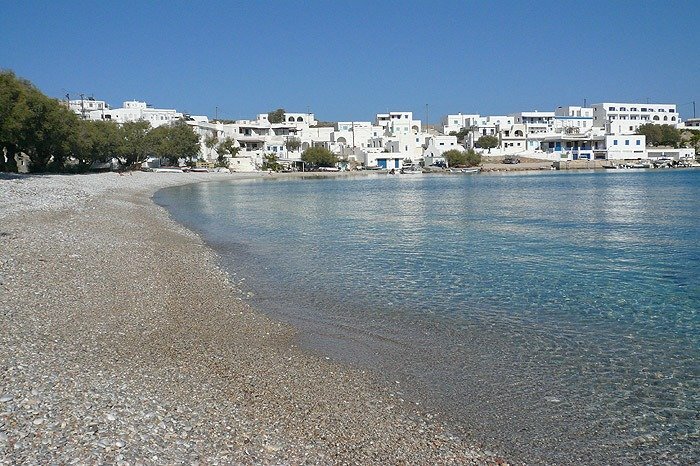 Drive towards Angali and take the boat to Agios Nikolaos and Livadaki or alternatively drive to Ampeli. Whichever beach you choose, you will swim in crystal turquoise waters. In the afternoon visit the Folklore Museum and learn about “themonies” in Ano Meria. You may also take part in agricultural activities at the hotel’s cultivating land nearby. Get on board to Katergo beach from Karavostassis port.”Katergo” is the most famous beach on the island. Do not forget to have water, parasol and a snack with you, as there are not such facilities there. In the afternoon, have dinner at VEGERA Restaurant in our hotel and afterwards enjoy one last drink in one of the beach bars on the pebbles. Short routes around the hotel on a Mountain Bike ride will be memorable for you. You can enjoy a ride on the beach or visit “Livadi” village nearby. There are bicycles available at the hotel. You may ask for one at the reception and enjoy a ride around Karavostassis bay. The bicycles are free of charge for the hotel guests. A unique experience no one should miss. The tour starts at 11.00 on selected days and lasts six hours. The boat is docked at the pier, 300 m from the hotel on the other side of Karavostassis bay. During the tour you have the opportunity to visit and swim in five of the most beautiful beaches of the island which cannot be reached neither by car nor on foot. Depending on the weather conditions, the tour takes you to the north side of the island or the south one, or both sides. A light meal is also served on board. A reservation is necessary at least one day prior to departure, so please contact the front desk in time. We will be happy to assist you. Folegandros is an ideal place for hiking. There are a lot of footpaths which cross the whole island and pass by dry stone walls and abandoned windmills, picturesque white chapels and traditional “themonies”. Away from the beach, up on a hill, there lies a piece of land which is cultivated by the people of ‘Vrahos Boutique Hotel” all year long. During spring time the soil is prepared for the summer crop and our farmers plant all kinds of summer vegetables such as tomatoes, cucumbers, green peppers, eggplants, as well as fruit, such as melons and watermelons. Our guests are more than welcome to visit the field and take part in the procedure of watering the soil or gathering the crops. Afterwards, they may also taste the products they have gathered, in the form of a salad or a freshly cooked meal at our Vegera Restaurant.